Georgian 2 ⅜" Primed MDF Cornice, 12 feet long, (longer lengths may be available). The cornice projects 1 ⅝" from the wall and 1 ⅝" from the ceiling. A popular profile used for making interior cornice frieze boards, headers, column capitals and trimming entrance systems. A stand alone set of an interior, round, wood (MDF paint-grade) caps and bases for our round wood tapered or non-tapered columns. Available for either 6, 8 or 10" round sized as shown on drawing. Not recommended for outdoor use. 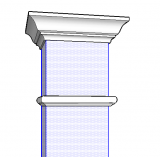 Scroll Polyurethane Pilaster Capitol for a 7 5/8" wide stem, 1 1/4 thick and 8 1/4" high. Our common pilaster thickness is 2 3/4", if you are ordering the shaft from us, we will cut down by request. Alternatively, we offer most of our pilasters in 1 1/4" thickness. A Tuscan Column Base and Capital Set made from no maintenance, polyurethane. Made for either our 8" or 10" non-tapered, square, Fiberglass Columns. A perfect match for our Smooth or Recessed Paneled Fiberglas columns. They may be used indoors or out. These ornaments slip on to the shaft and do not effect the height of the column. A set of high density, impact resistant, polyurethane Non Tapered column base and cap set. A prefect match of any non-tapered 8" diameter wood, Fiberglas cast, or Pultruded Fibreglass Column Shaft. They may be used indoors or out. 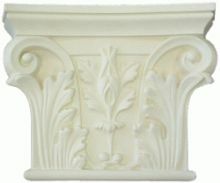 Ionic Capital in Polyurethane, 14 3/4" X 14 3/4" across the top, 4 1/4" high can accommodate a column shaft 6" in diameter at the top and usually 8" diameter at the bottom. Temple of Winds Capital in Polyurethane, 14" X 14" across the top, 14" high to accommodate a column shaft 8" in diameter at the top and usually 10" diameter at the bottom. Also referred to as Greek Corinthian. Roman Corinthian Capital in Polyurethane, 14" X 14" across the top, 14" high to accommodate a column shaft 8" in diameter at the top and usually 10" diameter at the bottom.